What goes up, must go down and vica versa. After a month of gyrating in a fairly narrow range, we may just be on the cusp of a breakdown. The triangle pattern which I never believed was valid will die if we cross the thin blue line, the low of wave wave c. There would still be a possibility of a larger, more protracted triangle but that is getting very thin. It is far more likely that we are in a third wave of something; this would be the case if we get a solid down day, that is 700 points or more. We will see. Again there are a lot of triggers that could start this downdraft. 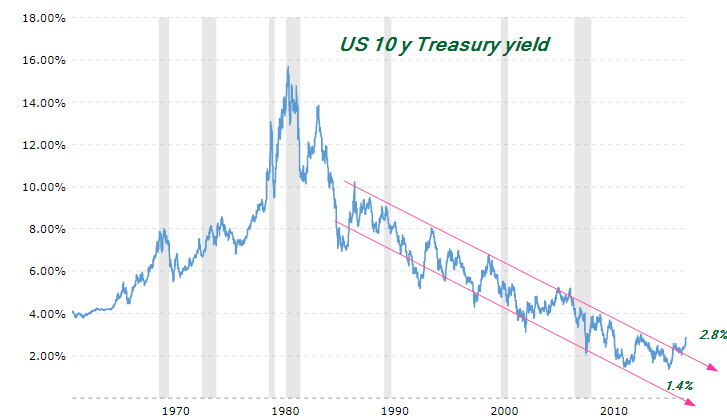 We now have not one but two “Stormies” , a looming government shutdown, Cambrige Analytica and a whole slew of other things but the most fundamental factor is shown in the second chart, the yield on the 10 year Treasury bond/note. It is generally accepted as a proxy for interest rates, a sort of base-line. It has broken out of a 30/35 year channel and has already doubled! Theoretically the present value of just about everything has been cut almost by half, but not stocks. It takes time to adjust but we should expect at least another 50 basis points before the year is out so this would just accelerate. I suspect that Boeing, BA, will be an excellent indicator of how fast things can go south.